The footbridge connecting Jersey City’s waterfront with Hoboken is nearly complete. The bridge will create an important link in the waterfront walkway and connect the Newport development in Jersey City directly to the Hoboken Terminal. The project was long talked about and much delayed by the transit agency. 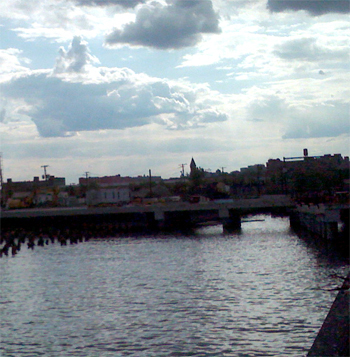 A small, unused canal separates Jersey City from the Hoboken rail yards adding to the expense of completing the walkway. The bridge is mostly built with railings, pavers and lighting yet to be installed. The project, scheduled to be finished in June, will provide a more direct route for pedestrians between the two cities. For now, the pathway will route through the Hoboken Terminal. Eventually the walkway will extend around the exterior of the station though these tentative plans are not finalized. The Lefrak organization completed a final segment of the waterfront walkway between the Aqua tower and the new bridge last year. When the bridge opens, the waterfront park will extend from Frank Sinatra Park in Hoboken south to the Colgate Clock in Paulus Hook, minus a short segment in Newport where the Lefraks built an office building up to the waterline. One day, the hope is to connect waterfront parks from the George Washington Bridge to Liberty State Park.